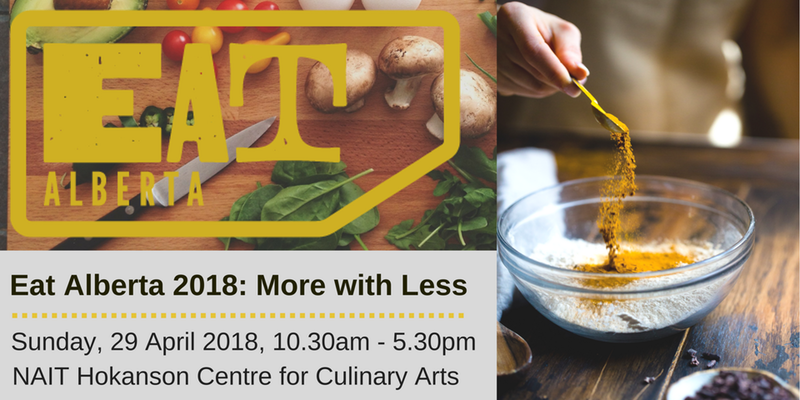 We are excited to announce that April 29, 2018 will be our date for Eat Alberta 2018: More with Less! By finding new uses for the items you already buy or exploring less common ingredients, Eat Alberta 2018 invites you to cook some creative dishes and learn some tips that could lead to reduced food waste and potentially reducing your grocery bill! While we are still confirming our chefs and keynote speaker, we will be continuing our partnership with NAIT, as the day will start once again with a tasty brunch at Ernest's. We are also proud to announce that chef, blogger, and self-described lady butcher Elyse Chatterton will be joining us for Eat Alberta 2018 as one of our session chefs. Some people may see offal and think "Liver, brains and hearts! Oh my!" but Elyse is a master at showing the uses, value and benefits of these cuts. We're so glad to have her back! However, that doesn't mean we're not exploring changes this year, as we will be doing an Early Bird promotion all December. In this case, you really get more with less, as you save $25 on tickets and get first access to classes once we confirm our chef line-up. Whether it's a Christmas gift for you and a special someone, or a well-deserved gift to yourself, we really hope that you take advantage of this opportunity, so head to Eventbrite starting December 1 to get your tickets! Of course, if you prefer to "sleep in" and have more knowledge about the classes before buying, no worries! We expect to have more details soon, so stay tuned to the blog and social media for updates! We can't wait to see you at Eat Alberta 2018: More with Less!